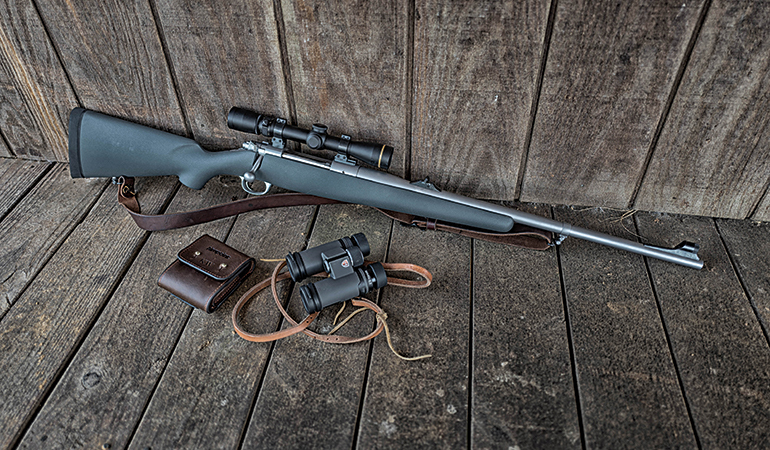 Designed with dangerous game in mind, this rugged rifle is loaded for bear. When discussing most hunting cartridges, gun writers often declare them suitable for “everything but big bears or Africa’s Big Five.” But what if bears or the Big Five are on the menu or your journey will put you among those big creatures who bite, scratch, and stomp? A style of rifle was developed in the early 20th century specifically for targeting dangerous-game animals on the plains and in the thorn thickets of Africa. When you take all of the virtues of such a rifle but substitute stainless steel and carbon fiber for rust blued steel and English walnut, you have a rifle that can tackle dangerous game in any climate: the Kimber Talkeetna .375 H&H. Last summer found me hunting sheep in one of the most-remote areas of Alaska’s Brooks Range. Though sheep hunting conjures up images of traversing steep scree fields and scrambling over boulders, there is also plenty of time spent hiking through the thick brush that chokes the river valleys. When the vegetation limits your view beyond a few yards and you start seeing fresh grizzly tracks in the mud, big rifles come to mind. My thoughts drifted to what the ideal guide rifle might be for such terrain, and the Talkeetna was the easy answer. The names that Kimber gives its rifles do a pretty good job of explaining the hunting niche they fit into, and this rifle was clearly engineered with Alaska in mind. The Talkeetna is essentially the stainless and synthetic version of Kimber’s Africa-themed Caprivi and comes chambered in the very useful .375 H&H. This is a rifle ideally suited for dangerous game in austere environments, and weighing-in at seven pounds, 12 ounces, it’s portable enough for rough terrain. The Talkeetna balances well and feels even lighter than it is. If I was forced to pick a single rifle for all of Alaska’s game, it would look a lot like this one. The Talkeetna wears a 24-inch stainless-steel barrel mated to Kimber’s 8400 action. Reliability is a big deal when it comes to animals who fight back, which makes the action itself a key cog in the system. Though it is often described as a “controlled round feed” action, the 8400 is actually a bit of a hybrid. Unlike a Mauser ’98 or Pre-’64 Model 70, the Kimber acts like a push-feed action until the cartridge clears the magazine’s rails and is fed into the chamber where the full-length extractor can snap over the case rim. This big Mauser-style extractor provides a great grip on the cartridge case and, combined with a fixed ejector, is pretty well infallible when set up correctly. 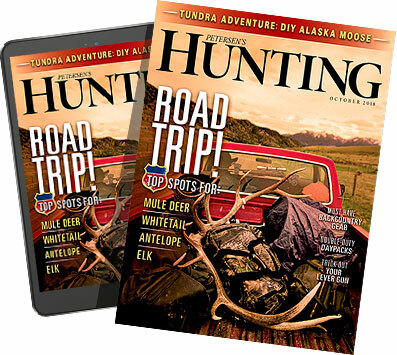 To test the Talkeetna’s reliability, we stuffed a magazine with a 350-grain Woodleigh Solid, a 300-grain Barnes Solid, a 300-grain Barnes TSX, and a 260-grain Nosler Partition and fired the rifle as fast as recoil would allow. Our test model fed all four different bullet types without a hiccup, extracting and ejecting the cases with gusto. This rifle fed, fired, extracted, and ejected with 100-percent reliability throughout our testing. There is more than just chambering a rifle in a big caliber that makes it a suitable dangerous-game rig. The stock must be shaped so that the rifle handles quickly and points naturally—both of which are virtues of the Talkeetna. The stock is pillar bedded, which adds strength and enhances consistent accuracy. A barrel band sling swivel prevents the stud from impacting the hand during recoil and also ensures that a slung rifle rides lower on the shoulder, making it less prone to snagging on brush and other obstacles. Finally, we find a set of high-quality steel sights, made by ERA in Germany; the hooded white front bead and single-leaf adjustable rear notch are robust and provide a degree of accuracy potential that would come as a surprise to many scope lovers. We mounted the Leupold 1.75-6x32mm—sadly, it’s discontinued—to the Talkeetna in a set of Talley QD rings and bases. Scoped, loaded, and wearing a leather sling, this rifle weighed nine pounds, five ounces. In a pinch, the scope could be removed without tools, and the sights are there as a backup. Accuracy was excellent, and though I couldn’t match the 0.65-inch three-shot group on the factory test target, I came pretty close. The .375 H&H cartridge has a reputation for putting bullets of varying weights into similar points of impact, but I don’t rely on legends, so we tested its bona fides. True to its reputation, this rifle shot both Barnes 300-grain TSX and 300-grain RN Solids into the same sub-MOA group. Bullets ranging from 260 grains to 350 grains all landed within groups the size of a tennis ball at 100 yards, so borrowed ammunition would likely get the job done in a pinch. I’m not going to lie to you about recoil. Shooting a lightweight .375 from the bench is not a ton of fun, but that’s not what this rifle was built to do. Recoil is totally manageable from realistic field positions and, in my experience, would be downright unnoticeable during a real-world encounter with a dangerous-game animal. I should note that lightweight rifles in larger calibers can be extremely hard on a scope’s erector system, so choose optics carefully and test often. Carrying a backup scope, zeroed in a set of rings, is never a bad idea on a hunt in a remote location. Kimber designed the Talkeetna for dangerous game, but the .375 H&H is one of the most versatile cartridges ever designed. With commercially loaded ammunition with bullet weights from 250 to 350 grains available, the Talkeetna is up to any big-game hunting task. African hunters have long used the .375 for everything from tiny antelopes to Cape buffalo. I wouldn’t hesitate to carry this rifle on a moose hunt in grizzly country or even on a Kodiak Island deer hunt where big bears could show up at a moment’s notice. Alaska is home to some of the world’s largest land predators. Hunting those powerful creatures—even hunting among them—can demand a rifle with specific attributes. Kimber’s Talkeetna is a powerful workhorse that handles quickly and can be carried all day. It is chambered in an effective and versatile cartridge, and it’s both reliable and accurate. This rifle was designed and executed with dangerous game in mind, and according to our testing, Kimber’s engineers hit their mark.